Joy to the World has been a popular Christmas Carol ever since the 1800’s, it’s a favorite of millions of people across the world. A detailed melody version, which will get you playing a nice base+melody cover as well. Each version has it’s own merits and can be used at different occasions, so you’ll want to learn both. We’ll start out by learning the chords to Joy to the World, as well as the chord progression. 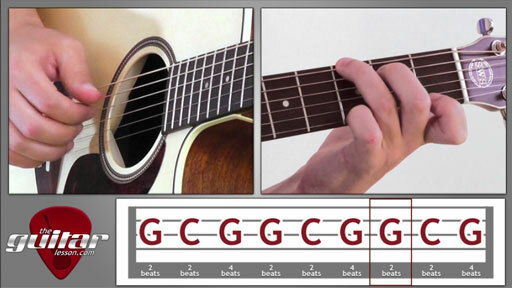 We’re learning the carol in the key of G, so our chords will be centered around chords you typically find in that key. Once we’re finished with the chord progression, you’ll already be able to play along with a singer 🙂 But you won’t want to stop there, since the melody part of the lesson is just coming up. If you’re not that into singing, or just want to practice fingerpicking, you’ll have a chance to learn a rich melodic guitar cover of Joy to the World in the second section of the video tutorial. The chord progression will stay the same, but you’ll be plucking the melody line as well along the higher strings. The words to Joy to the World were first published in 1719 by the English Hymn writer Isaac Watts. Only the second half of Watts' lyrics are still used today. The music was published over a century later by Lowell Mason in 1839. Sorry, but you've reached a premium content area. The download of the Joy to the World tablature file is only available to premium members. Sorry, the same goes for the backing track. To download the backing track to Joy to the World, please log in and revisit this page.